It lacks some sexier features, but it has nearly all the ones that matter most. VTech might be synonymous with cordless phones in most people’s minds, but the company has also put out a succession of reliable baby monitors, many of which we’ve reviewed. It’s not a big leap from baby cams to security cams, and the VC931 HD Pan and Tilt Home Monitoring Camera shows the company is as adept at helping you keep your house as safe as your other precious assets. The VC931’s ball-shaped design takes its cue from vintage webcams, a look home security monitors have moved away from over the last few years. Despite its somewhat dated appearance, this camera is packed with the features security DIYers prize: motion detection, night vision, two-way talk, and even a sleep mode for privacy. You also have your choice of video storage options—you can save video directly to the camera or to the cloud. Video resolution, however, maxes out at 720p. Setup is exceedingly simple. Just plug the camera into a wall outlet, download the MyVtech Cams app, and follow the on-screen prompts to pair the camera and connect it with your Wi-Fi. 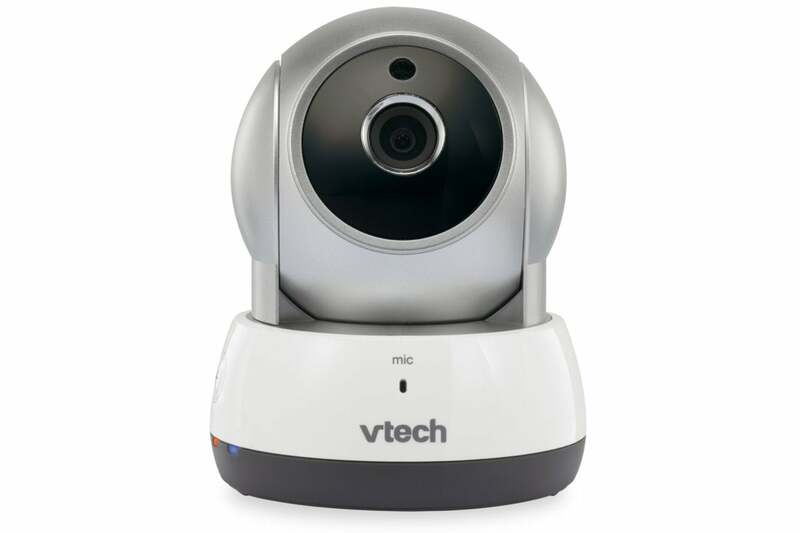 Once the process is complete, you’ll able to view the camera’s live feed, but if you want to record video—either continuously or only when activity is detected—you’ll need to supply and insert a microSD card into the camera’s base or opt for one of VTech’s cloud storage plans, purchasable in-app. Unfortunately, you can’t do both. Opting for VTech’s rolling 7-day or 30-day cloud options automatically disables local recording on the camera. That’s a bummer, as it’s always prudent to have a backup of your recordings. The VC931 pan-and-tilt camera lets you assign up to four preset camera positions. Basic camera operation is pretty straightforward. You select the VC931 from the camera list in the app (it supports up to 10 cameras) to access its live view. A scrolling toolbar on the bottom of this screen includes controls for activating/muting the microphone and speaker, recording video, taking a snapshot, setting the night vision mode, and changing the camera’s resolution. You pan and tilt the camera by swiping the live-view image in the direction you want the camera to move. There’s almost no lag between the swipe and the camera’s motion, and the camera rotates in short, controlled increments. Some gesture-based pan-and-tilt cameras have a tendency to overshoot, sometimes swinging all the way to the end of their axis, with the slightest swipe. Having to repeatedly recalibrate your camera angle is more than an inconvenience when there’s an actual intruder in your house—it can mean not capturing forensic evidence. The VC931’s precise movements made me confident I’d be able to locate and track activity easily during a real-world break-in. Even better, you can save up to four camera positions as presets. Once you calibrate an angle you want, you just long press one of the preset buttons accessible from the toolbar. As with the manual pan-and-tilt, the presets were instantly responsive and accurate. I had no desire to scrub through hours of footage of our house pets getting into mischief, so I switched the camera from continuous recording—its default mode—to motion-triggered recording in the settings. When motion is detected, the camera pushes a generic time-stamped alert to your phone. You can tap the alert—after you unlock your phone—to get directly to your live feed and see what’s happening. All videos are saved in a serachable timeline according to which recording method—local or cloud—is used. A note here, though: The MyVtech Cams app includes a helpful tutorial overlay that walks you through all the app screens the first time you launch it. If you don’t check the “never show again” box, it will launch this tutorial every time you reopen the app. As I found out, that includes when you open the app from a motion-detection alert. If you don’t want to have to frantically swipe through several how-to screens when you’re trying to investigate potentially criminal activity in your home, be sure to deactivate this feature after your first viewing. There are three motion-detection sensitivity settings: low, medium, and high. I found the middle to be the sweet spot, providing accurate detection without blowing up my phone with notifications. You can also change the notification frequency in the settings, or turn off notifications altogether. You can turn on Sleep mode, too, when you and your family want some privacy. 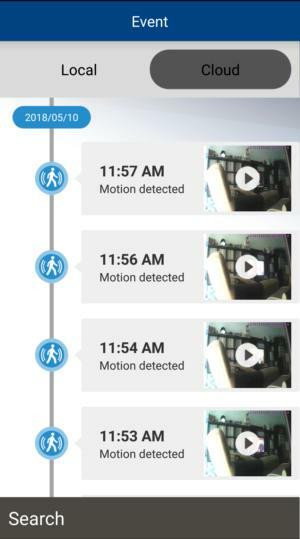 It’s not as simple as toggling it on, though; you must turn off motion detection and disable local recording first just to enable this feature, then activate Sleep mode. Honestly, it was easier to just unplug the camera when the whole family was home. All recorded videos are logged in an Events tab and are listed in a searchable timeline according to which recording method you’re using, local or cloud. During playback, you can download the video to your phone or delete it. Any snapshots or video you record manually are saved under its own tab. Both of these logs are accessed from the camera list screen. Video quality was sharp overall, but colors were a little dull. That shouldn’t be too much of a concern as you’re not saving these videos for posterity. Things get pretty pixelated the more you optically zoom in, which you can do up to 10x using pinching gestures. Night vision does a good job of illuminating dark rooms. The app gives you the option of setting the intensity of the infrared LEDs, which is a nice option, though I could only notice a difference in brightness around objects closest to the camera. There are better-looking home security cameras than this one. There are those with more advanced features, too: you won’t find motion zones, person detection, or integration with automation services like Google Home or IFTTT here. But VTech’s VC931 is still a solid pick. All the essential DIY security features are here, and what the camera does do, it does well. In a category that continues to swell with increasingly complex options, that’s worth a lot. 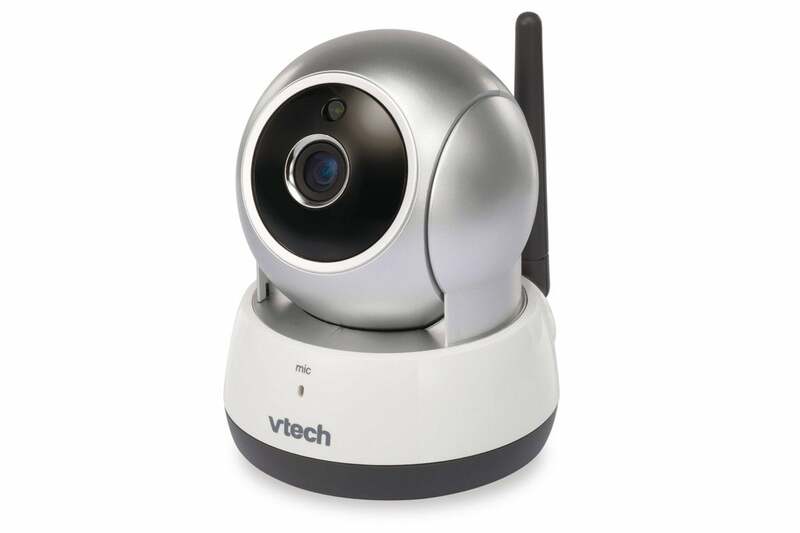 It doesn't have all the bells and whistles of many other cameras, but the VTech HD Pan and Tilt Home Monitoring Camera provides solid security features at an affordable price.